Kenworth is a very popular American truck manufacturer, known for producing medium and heavy-duty class 8 trucks. The American truck brand has built his reputation in Australia by constantly presenting innovations in its prime movers. Over the recent years, Kenworth has been focused on aerodynamics and performance enhancements, in order to design driver-friendly and comfy trucks. One of the best prime movers for sale Australia online and offline offer is the incredible T880. Ever since the introduction of Kenworth T800 and T600, the American company has been working on building a truck range to meet the taste of every truck driver. Kenworth T880 is company’s best truck and it is unique in all possible terms. This truck is available in two bumper-to-back-of-cab options: a 3.1-m cab with an ISX and a 2.9-m when specified with Paccar MX engine. You can even choose a sleeper option for increased flexibility and comfort. The T880 is known as a day-cab prime mover truck and it is a versatile, dependable and able to perform the toughest jobs efficiently and productively. This truck has the strength and stamina to move your business ahead day in and day out. Kenworth T880 is the world’s best way to get jobs done. You demand, it delivers. Built to last with all capabilities that are necessary, while keeping you comfortable and aware of everything that is going on with your prime mover truck. This incredibly flexible day-cab truck can be used as a bulk tractor, dump truck, heavy hauler, tanker, concrete mixer, refuse truck, logger and what not. With no doubts, Kenworth T880 will be the most versatile truck you’ve ever included in your fleet. Flexible, versatile and functional, the T880 is especially designed to deal with daily challenges. It has a street-smart design and is equipped with advanced technologies to provide incredibly driving comfort and great maneuverability. Some of these technologies are sloped hood, enhanced aerodynamic options, fuel-efficient drive train and job-specific options. When making tracks down a particular grade with mud on your back, it is important to be sure your truck will be able to deal with it. 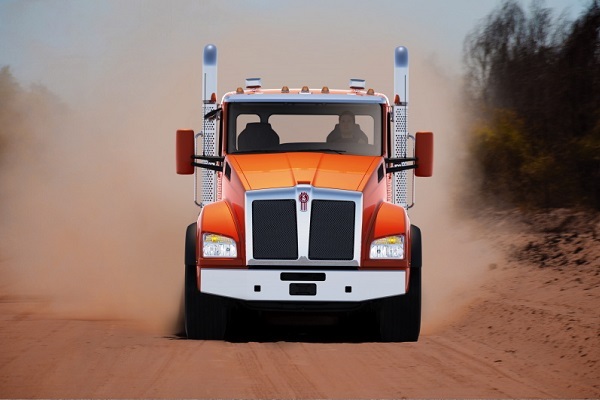 Kenworth knows how to design and build trucks that can deal with the toughest challenges in difficult working environments, which is a case with the T880 as well. Kenworth T880 is able to be fully loaded and still move over rough terrains and job sites that you would not even want to drive on. Don’t look for other prime movers for sale Australia, because Kenworth T880 is your perfect business partner, regardless of your application, it can even deal with big-size jobs.